Why are we teaching kids to use 1970s technology? Ever hear of Day Timer? 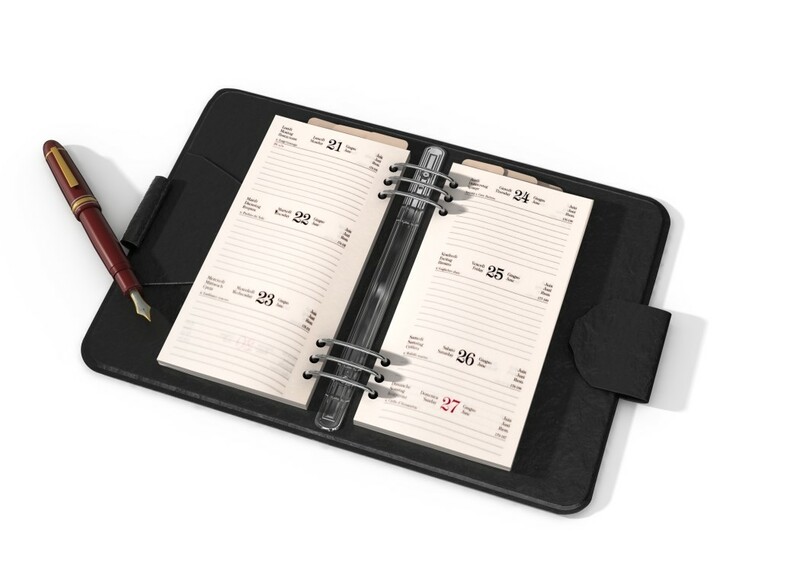 Yes, the personal agenda book still exists, but only for a few old school types. Except in schools, where the kids are supposed to use agenda books, and it’s all their damned fault if they don’t. If it were up to me, every kid would have exchange email and Outlook working seamlessly on their computers, tablets, and phones, and everything they need to do would be posted there automatically. It’s how professional adults do it. I made an appointment with an executive for 1:30 Wednesday, and I didn’t speak with him. Instead, an assistant posted it in his Outlook calendar directly, which he will then see sometime before 1:30 next Wednesday. My wife, an executive at a major corporation, shares and is shared with calendars of countless others who need to know when and where she is and vice-versa. It’s how we’ve been doing things (outside of schools), since the late 20th century. So why do we insist that kids write it down for themselves in a little book that no one else will see and that will more often than not be left in the locker every day? Even if we could get little Johnny to write down his assignments, what’s going to make him remember to bring the agenda book home and then look at it every evening? We provide them agenda books to help them do their work. Students must learn to take responsibility for themselves. Students should do as they’re supposed to. Rather than dumbing down the lessons and lowering expectations because kids can’t track their homework, why don’t we up the communication and student awareness of responsibilities, and thereby increase independent work fulfillment? It’s all so backwards. Here’s my wager, and I’m buying dinner if you prove me wrong: kids who make effective use of agenda books don’t need them. The teacher attitude, “Just do what you’re supposed to do,” will reward only the “good” kids — I mean, the “good secretaries” who — I repeat — don’t need help doing what they’re supposed to be doing. It follows, then, that kids who can’t or don’t use agenda books need something else in order to track and fulfill their school work. At the A+ Club we believe in constant, consistent feedback and reporting of assignments from teachers to students and families. From our informal surveys of online teacher assignment postings, we find that, depending on the school, only 20-40% of teachers consistently post upcoming assignments. The rest just assume that the kids will “do what you’re supposed to do.” It doesn’t have to be that way. We’re not just dreaming here: we are developing a feedback system to create 100% advance assignment reporting for 100% of teachers. (Call me for details.) We know it will work because we already make it work for students in our A+ Club system. We want to share that enormous benefit with all teachers and all students. But to get there, we will need teachers and schools to get past this idea that using agenda books is an important skill set for our children. Explain to me how, please, how posting assignments online on a regular basis is bad for kids? Good luck with that. Again, the students who do this already don’t need it. They’d be fine tracking work that you post online just as well as what you write on the board in class. In fact, relying on agenda books discourages student responsibility because it enables failure in those who can’t or don’t use them. It’s hard for teachers to do. Poor things. I guess they just want students to do what they’re supposed to do. Great. So how are those failure notices coming along? Actually, if teachers communicated assignments effectively to students outside of class, assignment fulfillment would go up, grades would go up, learning would go up, and misbehavior would go down. It’s in teachers’ best interest. Students should learn secretarial skills. Gotchya. Graduate from high school and go get a job as a secretary using those agenda book skills of yours. It amazes me how schools accommodate poor student choices while doing so little to change them. Rather than mitigate lack of assignment fulfillment with lowered expectations or poor results, let’s try something not-so-new, except in education: daily, electronic communication of teacher expectations. It will work, and students will respond, all without losing any of the benefits of all the other secretarial skills we’re busy teaching our kids. Moreover, it will benefit those parents who themselves don’t have the skills, time, or ability to track student work individually. Daily, complete assignment reporting will benefit students, parents, and teachers alike.